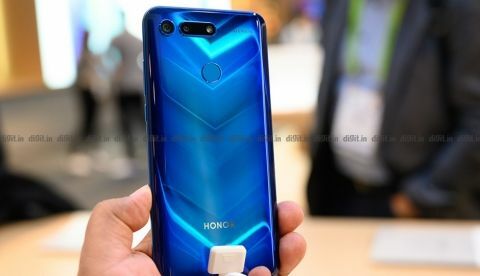 The Honor View 20 sports a number of impressive features on paper such as a 48MP camera, a ToF sensor, a punch-hole design instead of the notch and the Kirin 980 processor. Honor View 20 will be unveiled at global launch in Paris today. Livestream of Honor View 20 launch starts at 9:30PM IST. The phone comes with Kirin 980 SoC and 48MP primary camera. The Honor View 20 is ready for its global launch at an event being hosted by Honor in Paris. The launch will happen at 5PM. CET (9:30PM IST) and the event will be live streamed by the company. The Honor View 20 launched in China last month and boasts of some very impressive specs on paper. The Honor View 20 will sport a punch-hole design to accommodate the front-facing camera. The phone eliminates the traditional notch, increasing its screen to body ratio noticeably. The speaker gets placed in a tiny space between the display and the top frame. Another impressive feature the Honor View 20 brings to the table is in terms of imaging. The smartphone comes equipped with the Sony IMX 586, a 48-megapixel imaging sensor. We wrote about how this new wave of large-format pixel-sense sensors could finally revitalise smartphone photography. The primary 48-megapixel camera sports an f/1.8 aperture and is also capable of delivering super slow-mo footage at 960 fps. The rear camera also comes with a secondary Time of Flight sensor whose duties are to collect depth information and aid in autofocus. The front facing camera is a 25 megapixel unit with an aperture of f/2.0 The phone is powered by HiSilicon’s flagship Kirin 980 processor fabricated on the 7nm process. The phone also sports 6GB RAM and 128GB of storage. The display has a resolution of 2310x1080 and powering everything is a 4000mAh battery with support for Huawei’s 22W SuperCharge. The Honor View 20 launched in China last month (as the Honor V20) for a price of CNY 2,999 (Rs 30,500 approx) for the 6GB RAM/128GB storage variant and going all the way up to CNY 3499 (Rs 40,600 approx) for the 8GB RAM/128GB storage variant. We expect the pricing to be at least in-line with China’s if not cheaper. Huawei and Honor have been aggressively pushing to acquire more market share in India and part of the effort has been to price their phones more lucratively than the competition.